Def Jam Recordings was originally founded by Rick Rubin in 1983 in his New York University dorm room to release a single by his band Hose (a punk group). 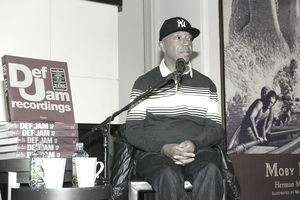 DJ Jazzy Jay introduced Rubin to Russell Simmons, who quickly became Rubin's Def Jam partner. Along with Simmons, Def Jam Recordings released the T La Rock and DJ Jazzy Jay single "It's Yours," the first single to bear a Def Jam logo. As such, Simmons is credited as a co-founder. The first releases to bear both a Def Jam logo and catalog number were released in 1984: "I Need a Beat" by LL Cool J and "Rock Hard" by the Beastie Boys. The first Def Jam singles garnered enough attention to allow the label to land a major label distribution deal with Columbia Records (a the time a subsidiary of CBS Records, which was subsequently bought by Sony). LL Cool J's classic "Radio," released in 1985, was the first Def Jam release to receive major label distribution and was their first full-length album. Around this time, Def Jam tried to get into the R&B business, founding the label OBR to cater to R&B artists. They had a hit with "The Rain" by Oran "Juice" Jones, but the label folded shortly after. During the course of the 1980s, Def Jam's success steadily grew. The 80s marked the move of hip-hop from the underground into the mainstream, and Def Jam was instrumental in helping the genre make that transition. During the 1980s, however, the label was not exclusively a hip-hop label. One of their biggest signings of the decade was metal group Slayer. Def Jam achieved one of their biggest successes of the decade—and became the subject of a great of controversy—when they signed Public Enemy at the end of the decade. During the 1980s, a power struggle was going on behind the scenes at Def Jam between founder Rick Rubin and Lyor Cohen, who had been working with Simmons who was managing Run D.M.C. In 1988, Cohen landed the role of president of Def Jam. Rubin left the label and started Def American Records, which was soon renamed American Records. Cohen and Simmons founded Rush Associated Labels (RAL) in the early 1990s as an umbrella group for several different labels, including Def Jam. The new business ventures proved expensive. Def Jam had several multi-platinum releases in the early 1990s, including releases by ONYX and EPMD, but they were still facing severe financial troubles by 1992. On the cusp of bankruptcy, Def Jam was bailed out when Polygram Records purchased 50 percent of the label. Polygram eventually gained a firm control, buying another 9.8 percent of the company. Warren G's "Regulate...The G Funk Era" was a sales success and helped the label further recover financially. In 1995, RAL was renamed Def Jam Music Group. Sales were good for the label during this time, thanks to releases by LL Cool J and Foxy Brown. Def Jam ended up under the Universal Music Group umbrella when Polygram was bought out by Seagrams, a division of Universal. Universal merged their Island label, creating Island Def Jam. Universal bought out Simmons for $100 million. Simmons became distant from the label at this time, but Cohen stayed on. Def Jam launched several new ventures during this period, including Def Jam South. They also distributed Murder Inc. Records, which would land Cohen in legal trouble. Def Jam Germany was launched in 2000 by Cohen to expand the label's profile internationally. Trouble arose for Cohen in 2003 when Murder Inc. Records was investigated for money laundering. Cohen had championed the label, and the investigation led to a raid of Def Jam's building. Around the same time, Cohen left the label for Warner Music Group. Antonio L.A. Reid took over Def Jam after Cohen's departure. Reid and Cohen fought for Jay-Z's contract, and to win the artist, Reid made Jay-Z president of Def Jam. Jay-Z's own Roc-a-Fella label had already been bought by Def Jam. Jay-Z's presidency contract expired in 2007, and it was not renewed, leaving Reid to step back into a leadership role. Since Jay-Z's contract expired, the label has been several other people in the role. With Reid taking over immediately following Jay-Z then in 2012 when former Warner Bros. Records executive Joie Manda was named the president.